The Limousin breed originated in a region of central France – rugged, granite country – where the summers are hot and winters are severe. The documented history of Limousin goes back more than 15,000 years to to an area surrounding the French city of Limoges where rough cave paintings showing the characteristics of the breed have been discovered and carbon dated. 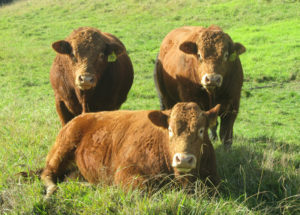 The Limousin herd book was established in 1886. Today the Limousin breed can be found in seventy countries from the northern-most herds of Finland and the Commonwealth of Soviet States to countries such as Cuba, South Africa and China.